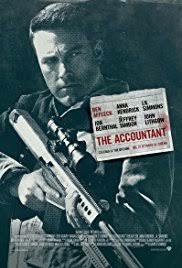 Review: Christian Wolff is an accountant who freelances as an assassin. A very odd and uneven little film. I felt there was almost too much going on and it didn’t quite know what to do or how to play out as a film. It is almost as if there are two different films rolled into one film. It is confused even in its subject matter. There are some bits in this that are entertaining. I don’t even ever remember there to be a scene in this with both Ben Affleck or J.K. Simmons in. I don’t think they even knew what they were doing in the film themselves. Near the end we have J.K. Simmons explaining the plot to us which is really useful! Even after the film you yourself start to ask questions. Nothing matches up at all. Despite the awful non existent story-line, one good thing about it is that all the cast are watchable, especially Ben Affleck and J.K. Simmons. Ben Affleck has said that this is one of his top five personal favourite performances. Watching this I found it hard work and this is not a film that I would look back on and remember fondly. This was originally envisioned with Mel Gibson and Joel and Ethan Coen directing. What a difference that would have made to the film.